I can’t imagine anyone in the United States has missed the news about Pope Francis visiting Washington, New York, and Philadelphia this week. I am interested on several levels, and one is the extraordinary steps to protect him. 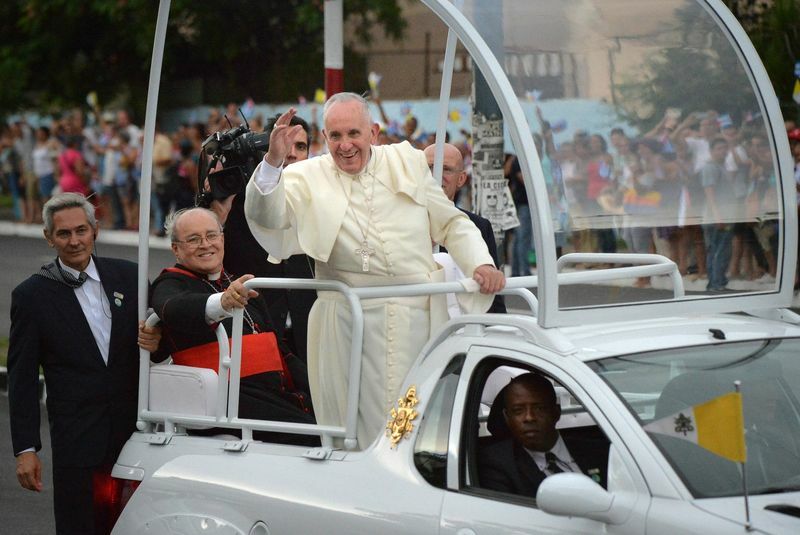 You can see the pope mobile which is open on the back and sides with no bullet proof glass. ( Previous popes have had a complete bubble of bulletproof glass.) Francis has said “At 78, I don’t have much to lose. ” But for the huge security detail, this creates an even greater nightmare. This security challenge in New York City was the most intricate ever for security of a foreign visitor and the only comparable is security for POTUS, President of the United States. The Secret Service, who guards the president, was put in charge of these security events. To prepare, the head of planning visited the Vatican to see procedures there for the Pope’s security provided by the Swiss Guard. I haven’t been to Rome in quite a few years, but when I was there the security was hardly noticeable. We went often to post mail at the Vatican Post Office because it was much quicker, by days, to reach the US than the Italian posts. We would see the standard metal detector standing before the main entrance to the basilica on days the Pope would be present usually for feast days. I have no doubt security is much tighter now. 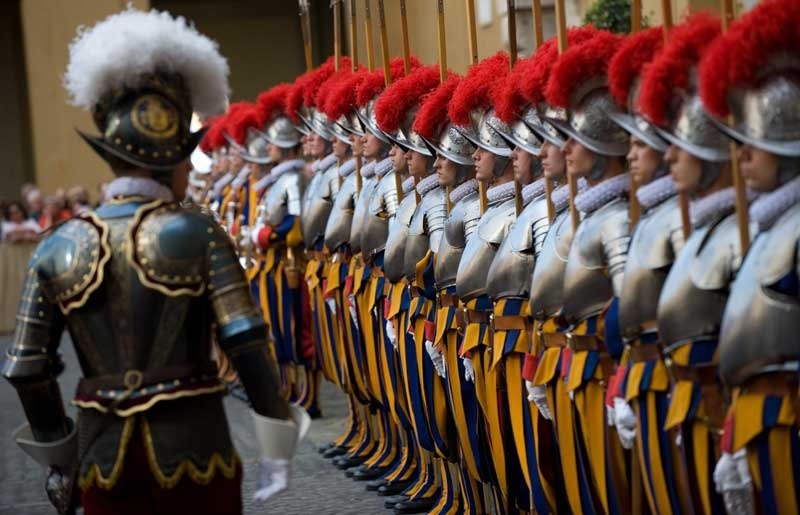 Swiss Guards standing at attention in the Vatican. They must be more fierce than their ancient uniforms make them appear. I saw one of the security gurus yesterday on TV explaining that the security is in concentric rings. People surrounding the pope as he walks or stops. Each of these professionals are watching, watching for anyone who seems suspicious. The next ring is police lining the route, with undercover security dispersed into the crowd. Lastly, there are snipers posted on buildings along the way. In New York, security was the tightest ever seen there. Streets closed with trucks blocking the intersections, an 8 foot wall along 5th Avenue and holding areas for people hoping to catch a glimpse. Of course the air space is closed during his visit. All the high end shops were closed on The Avenue. Trucks are parked to prevent access to the cross town streets. 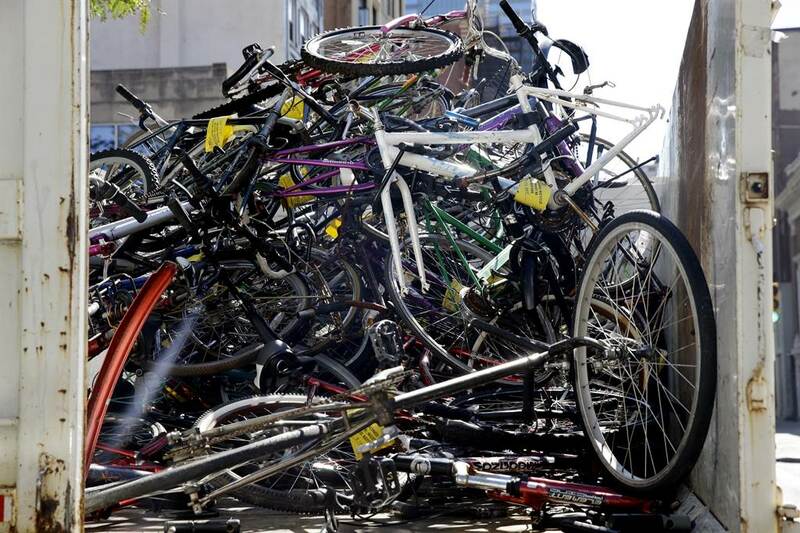 NYC is now a bicycle city but these were collected as abandoned. I guess there is fear they could be used as an airborne missile. 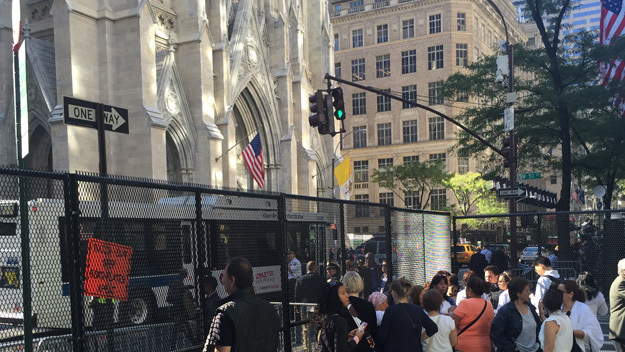 The fence on 5th Avenue in front of St. Patrick’s Cathedral. These months and months of planning and preparations have paid off in DC and New York as the trip is safely completed. Francis is in Philadelphia as I type. No doubt the security is similar there. 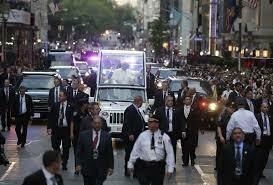 I know that Drexel College is closed as well as streets and shops l during his final visit. Your thoughts? Do you think this visit was worth the cost to the cites and the national government? This week in New York City there were 176 world leaders assembled to hear Pope Francis speak at the United Nations. We provided security to each of those visitors to our country, as well! 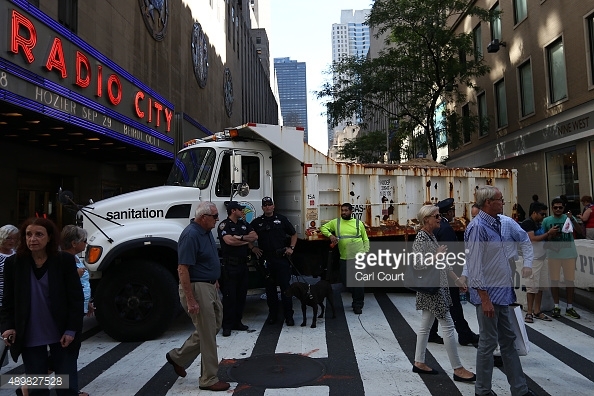 This entry was posted in Religions of the World, Uncategorized, USA and tagged logistics, New York City, NSSE, Philadelphia, Pope Frances, Pope's visit to the US, popemobile, safety, Secret Service, Washington DC. Bookmark the permalink.